Miriam Reyes is the co-founder of Aprendices Visuales (Books for Visual Learners), a nonprofit organization that connects children with autism with tools to develop their full potential, as well as a 2011 Premio Jóvenes Emprenedores Sociales fellow and 2012 Laureate Global Fellow. Bill Reese is the president and CEO of the International Youth Foundation. Bill Reese: You’ve been a part of the YouthActionNet community for six years now. Could you share what this experience has meant to you? Miriam Reyes: This has been a life-changing opportunity. My fellowship experiences helped me believe for the first time that I could spend my life leading change. Meeting the people involved in this network has shaped my leadership journey in profound ways. Hearing the stories of other fellows, answering their questions, and connecting around shared passions give me the energy, motivation, and support to sustain myself and my venture. I know I can’t solve all the world’s problems — yet being a member of the YouthActionNet community reminds me that I am part of a global team, all working together to build a better future. BR: How has your venture changed since the year you were selected? MR: When I became a fellow, my co-founder and I had just begun building our dream — to design a world prepared for children with autism. We started with one pictogram book that I made for my younger cousin with autism. After printing 1,000 copies of our first book, we quickly realized that if we wanted to reach the 64 million children living with autism globally, we had to leverage the power of technology. We partnered with health professionals, families, and autism organizations to develop a strategy to scale our stories and tools digitally while protecting the user-centered design essential to our model. Today, we are “millionaires” in social impact, having reached one million children with our 20 online books and interactive apps. Miriam Reyes shares a scene from the app her team developed to help visual learners connect with the world around them through stories. BR: Has your approach to leadership changed along with your venture? MR: My fellowship experience taught me to focus on my strengths — my ability to simplify complex ideas and focus on the most direct way to accomplish my goals. This has helped me unify and motivate others in a way I never imagined. Recently, I put these skills to the test when I orchestrated screenings of our first advocacy film through teams of volunteer teachers, nonprofits, companies, and social activists in 80 cities across Latin America and Spain. BR: What do you think are some of the biggest challenges faced by young social entrepreneurs today? MR: Before I joined YouthActionNet, I didn’t know social entrepreneurship existed; I just knew I had a project I wanted to develop. For me, this illustrates a major challenge faced by would-be social entrepreneurs. In many contexts, running an organization where the goal is to change lives rather than earn money is still not widely understood. From feelings of isolation to practical matters like legal registrations and finances, social entrepreneurship will remain challenging until it is more mainstream. For me, youth has been an asset rather than a hindrance to leading Aprendices Visuales. I’ve gained access to opportunities to grow my skills and increase my venture’s visibility through youth-focused fellowships and recognition. 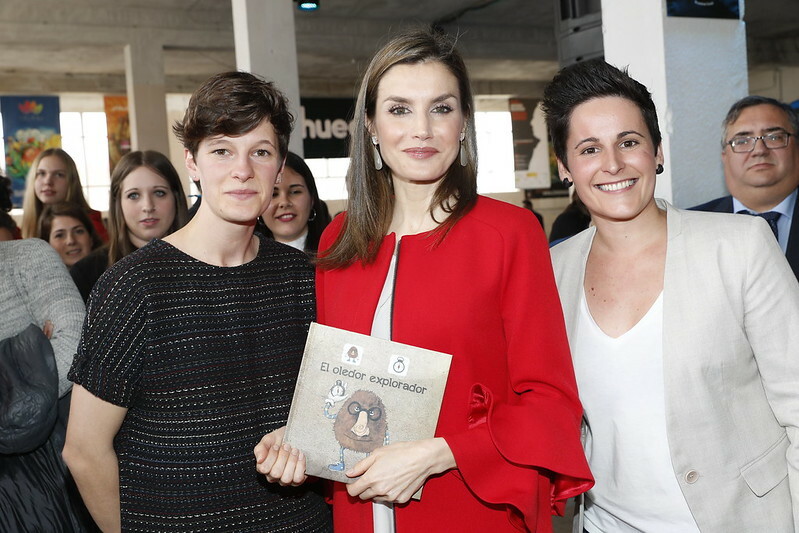 Miriam and Aprendices Visuales co-founder Amélie Jézabel Mariage with Queen Letizia of Spain after being recognized for their work. BR: What do you see as opportunities for universities in encouraging youth-led change? MR: University is a great place and time to start a social venture. As a student, I had economic support from grants and family, so I could focus on testing, failing, and learning. Universidad Europea has been a fantastic supporter of Aprendices Visuales, promoting our work in creative ways such as placing our illustrations on their annual holiday cards or hosting advocacy events on campus. I think universities should be places where young people learn that social entrepreneurship is a viable career path, and that community service is important no matter what career you choose. BR: I’d love to know what’s next for your venture. What do you hope to achieve in the next five years? MR: In the next five years, we plan to go from five to 10 languages in our platform and reach five million children worldwide. We want to develop an improved tool for early detection of autism, since we know that the sooner it’s diagnosed, the better the learning outcomes will be for children. We’re also interested in promoting more inclusion in the classroom, possibly through visual learning methodologies appropriate for all children. The problem isn’t that people have autism, it’s that the world isn’t prepared for them. My vision is a world where autism is seen as a normal human condition — not something to hide. This interview originally appeared in Laureate’s 2017 Global Impact Report. To learn more about Aprendices Visuales, visit www.aprendicesvisuales.org.